Florida’s capital city has plenty of fun experiences for everyone. You can choose to head outside and catch a fresh breath of air and explore, or visit an indoor attraction and hang out. It doesn’t really matter what you do, you’re bound to have fun, the Tallahassee way. We at the Torch know that it can be difficult deciding what adventures to take on in Tallahassee. That’s why we wanted to help you out and create our own list of the best things to do in Tallahassee. Say goodbye to that difficult decision and say hello to some of the best places the Floridian capital has to offer. This park is described as being “a masterpiece of floral architecture”. Alfred B Maclay Gardens State Park features a stunning brick walkway, a secret garden, reflection pool, walled garden and hundreds of beautiful plants across the facility. This beautiful garden has been around Tallahassee since the early 1920s and has slowly grown in beauty over time. The lake Hall offers swimming, fishing, canoeing and kayaking opportunities and prohibits fuel-powered boats. The park is also great for hiking or biking along the beautiful nature trails. You can also picnic at this amazing Florida destination at the end of your day in case you want to enjoy the beautiful sunset. Visiting the Florida State Capitol is definitely one of the top things to do in Tallahassee. Over the course of its history, Florida’s state capital has grown along with the state. This means that the State of Florida has definitely been through more than one State Capitol building. 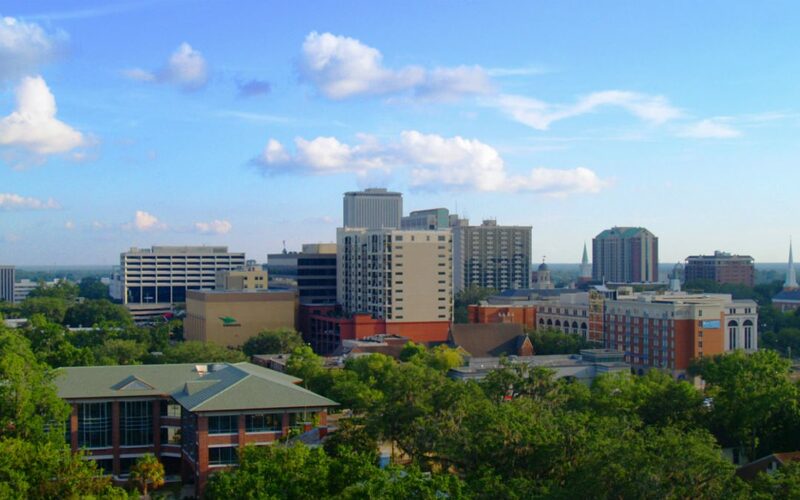 The state capitol in Tallahassee overlooks the city and allows visitors to go up to the 22nd floor for a look. Today, the Florida State Capitol is a representation how much the orange state has grown. Cascades Park serves as the city’s main social center. It is a 24-acre park with plenty of green lawn space to enjoy. Two of the best features of the park is the Boca Chuba Pond and the Capital City Amphitheater. The parks also features an interactive water fountain, children’s play area, and plenty of multi-use trails. The amphitheater also serves as the park’s center for entertainment and community events. The Tallahassee Museum serves the community by educating its visitors about the natural and cultural history of the Big Bend area. It has hundreds of nature and cultural exhibits to view accompanied by historic explanations. The Tallahassee Museum is not just a indoor spot to visit, it also has plenty of outdoors to explore. This museum does a remarkable job of preserving the beauty behind Florida through fun and excitement. Its nature walks and tree-to-tree adventures easily put the museum on the top things to do in Tallahassee. Head over to the Tallahassee Automobile Museum if you’re a hot rod enthusiast. The museum has on of the nation’s largest collections of automobiles that date back to the beginning of their time. You’ll find a load of beautiful paint jobs and run into a few things that don’t have to do with automobiles. Yes, the Automobile Museum does have exhibits that focus on the wildlife and other history of Florida. This museum is more than a journey through time. Visiting the Railroad Square is another one of the many fun things to do in Tallahassee. It hosts more than 50 studios, galleries, and small shops full of artistic sense. Railroad Square Art Park is the fastest growing area in Tallahassee that welcomes people of all ages. You’ll run into endless art and have the opportunity to join in on all the food, fun, and shopping in the area. This area is also surrounded by some of the newest building around town and most unique creations in Florida. The Sky Zone Trampoline Park is the perfect spot to take your family. Every adult and kid deserve some time off and this place has exactly what you need to have some fun. The Sky Zone has plenty of fun trampoline activities including hybrid sports and your favorite gym games. This attraction features a foam zone, ultimate dodgeball, and other fun activities that will allow you to stay active without paying attention to time or calories. The Trampoline Park also allows you to rent out the facility for private events in case you’re wanting to surprise your kids with some private fun. This well constructed park serves as the perfect escape from stress and the buildings across Tallahassee. The Greenway is covered with over 6 miles of trailways perfect for hiking, jogging, cycling, and horseback riding. It’s a great place to take a walk around one of Tallahassee’s most beautiful green areas along with some good company. The Miccosukee Canopy Road Greenway also has great picnic areas and benches for you to sit back and enjoy a date with your family. This spot is also home to some of the most gorgeous scenes throughout the year where you can spot the wildlife’s different colors. Located just north from Tallahassee, the Lake Jackson Mounds archaeological State Park ar ancient Native American temple mounds. The part gives the Florida community the chance to explore the historical ground’s beauty. This area was once a large plantation owned by Colonel Robert Butler. Today, this state park serves as a popular spot for bird viewing and family activities in the great outdoors. The trails are a mix of ground, sidewalks, and bridges that make it one of the best spots to challenge yourself for a run. The “Mission Control” and the Space Station laboratory is a must-see spot in downtown Tallahassee. This five story planetarium exhibits some of the best star shows you’ll find on the west coast of the country. If that’s not enough, the center also has an IMAX and IMAX 3D theater where you and your family can enjoy a fun and interactive adventure. Be sure to invite your friends because this experience is definitely worth sharing with others. This destination is a wildlife sanctuary located south of Tallahassee. It is also home to some of the clearest waters known to the area. Many locals love to head over the the natural springs for a nice dip that will beat the Florida Heat anyday. The park also includes trails for exploration and the ever popular diving spots in the springs. This museum houses artifacts that date up to 12,000 years of age, making it one of the top things to do in Tallahassee. You’ll find plenty of war and classic historical items as well as dinosaur exhibits across the museum floor. The Museum of Florida History is so big that you’ll need more than two hours to visit and learn about each exhibit. Just be sure to divide your time wisely because there’s plenty to see and enjoy around the facility.